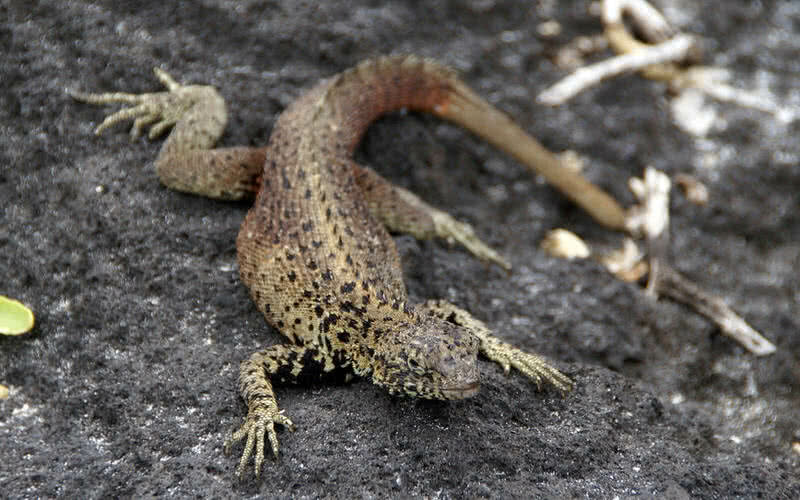 Lava lizards are small reptiles lives on main Islands of Galapagos. 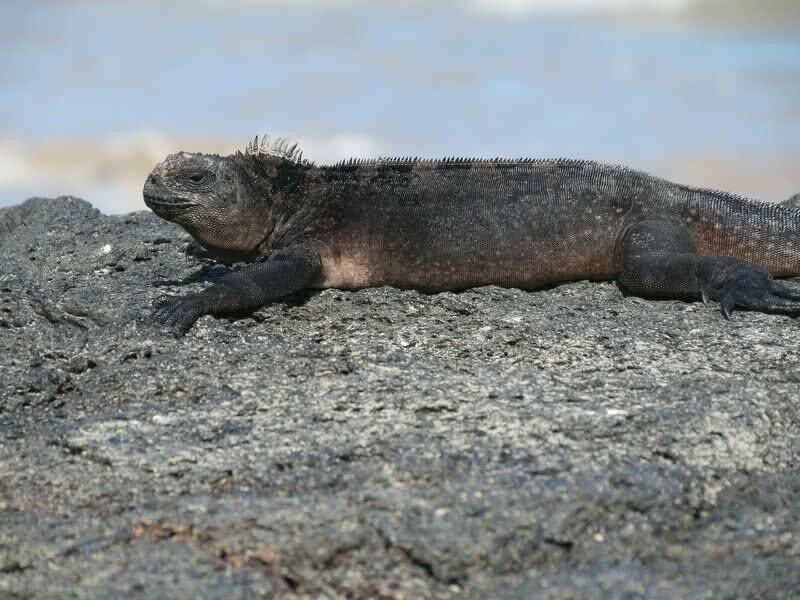 There are seven recognized sub species of lava lizards that are endemic to Galapagos Islands. The color, size and behavior of lava lizards varies between Islands. Generally they inhabit rocky areas of Galapagos Island. Lava lizards are grow upto length of 30 centimeter. Male lava lizards grow about three times heavier than that of females. They have pointed head and tapering tails. The coloring of lava lizards varies from dark brown to reddish brown depending on age. Male lava lizards also have special pattern of markings on their body. Both male and female lava lizards becomes very aggressive on defending their territory against intruders. They feed on insects, ants, spiders and snails. The life span of lava lizards ranges from 7 to 10 years. 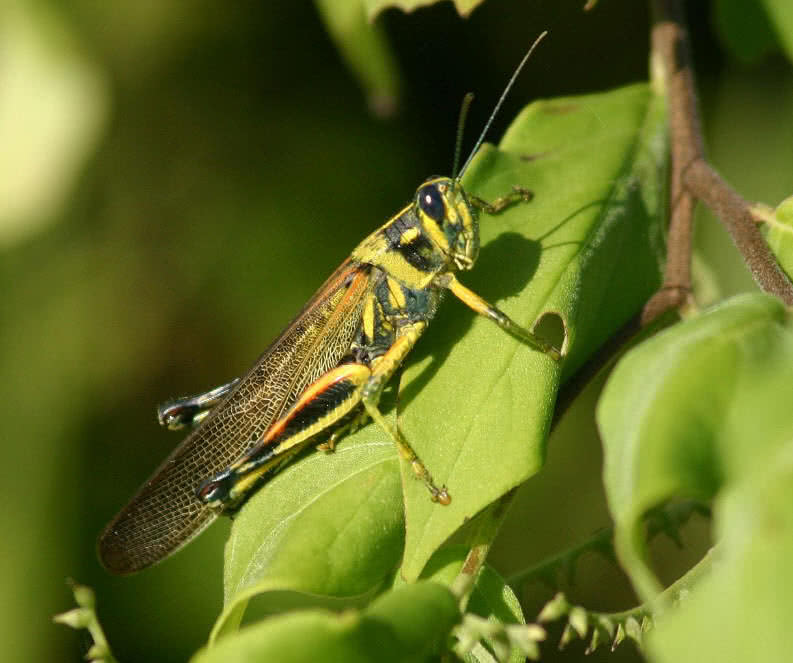 Large painted locusts are one of most beautiful and colorful creatures on Galapagos Islands. They are endemic to Ecuador Island of Galapagos. They are very small in size, only grows up o 8 cm in length. This group of insects also become main prey for Galapagos hawks and lava lizards. Darwin’s finches are small land birds that are colonized on in the Islands of Galapagos. They are also known as Galapagos finches, were first recorded by Charles Darwin during his visit to the Island in 1835. In fact Darwin finches are not belong to any of recognized bird family. 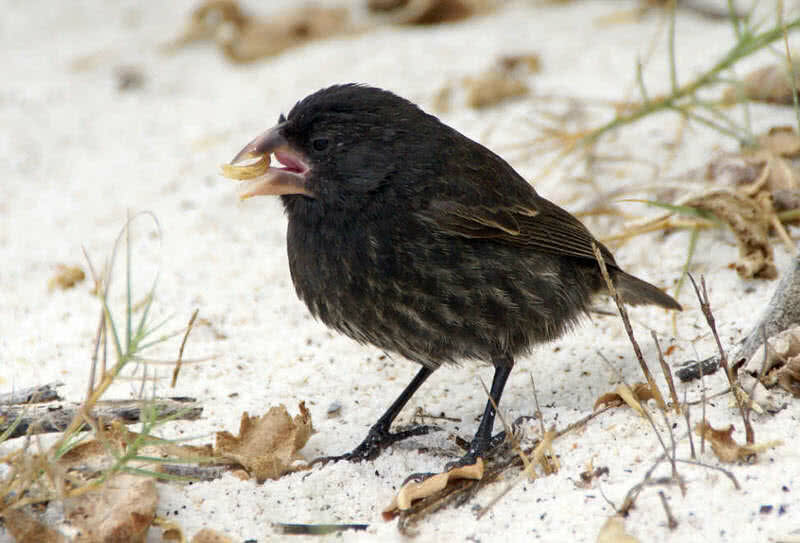 There are thirteen different groups of Darwin finches found within Galapagos. Their size and shape of beak also changes from Islands to Islands. Their population on different Islands of Galapagos also become distinct. The size of Darwin finches varies from 10 to 20 centimeter and they normally weigh between 10 and 38 grams. The color of Darwin finches also varies as dull black, olive or brown. They feed on different types of food depending on the Islands they belong to. Their sharp beaks are also highly adapted for finding and having different sources of food. It is a medium sized bird endemic to Galapagos Islands. There are four recognized group of mocking birds found within main Islands of Galapagos. Their size varies between 25 and 28 centimeters. They have long legs, long tail and long decurved beaks. 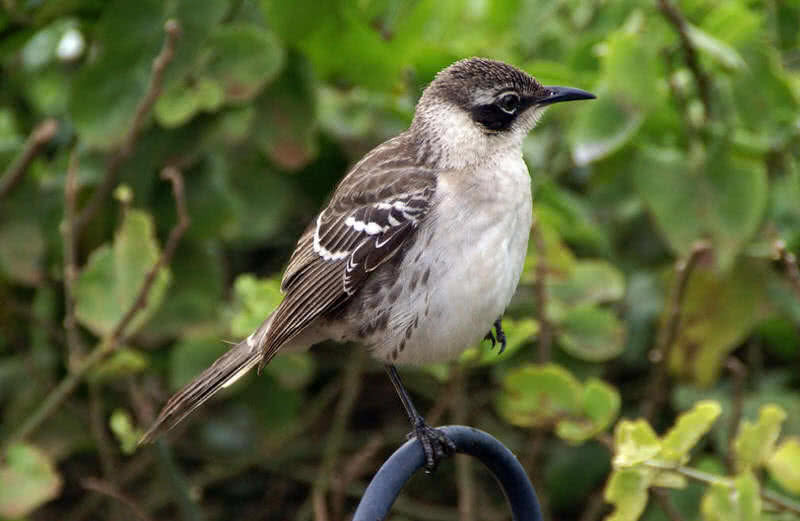 Most species of Galapagos mockingbirds used to travel by foot and rarely flies. They also make loud and melodious sound. Galapagos mocking birds are omnivorous in nature. Their diet varies from seeds to eggs to baby turtles. It is the only species of cormorant that lost the ability to fly. It is also one of the unusual birds in the world native to Galapagos. The total population of flightless cormorants estimated between 700 and 800. Unfortunately their population decline dramatically over years. 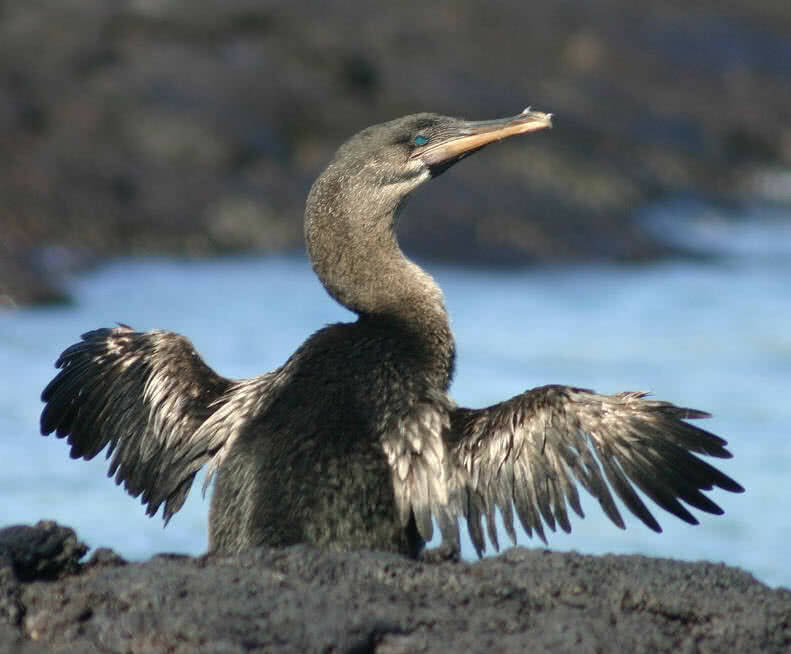 Flightless cormorants are endemic to Galapagos Islands. Flightless cormorants measure 30 to 40 inches in length and weighs between 3 and 5 kilograms. They have webbed feet, long legs and long hooked bills, highly adapted to catch fish underwater. At the same time the webbed feets help them to travel through ocean waters easily. Galapagos hawk is the only diurnal raptor of Galapagos Islands. They readily identified by their dark plumage and broad wings. They measures up to 27 inches in body length and have wingspan of 47 inches. The male Galapagos haws are relatively smaller than that of females. They inhabit in most of Islands of Galapagos. But they are very few in population only 130 known breeding territories are in Galapagos. Galapagos haws have very strong legs, sharp hooked beak and powerful eyes. They hunt in group of two or three members. Their strong legs and beaks help them in catching preys or picking rotting carcass easily. They often steal eggs from the nest of other birds. They have no natural predators. The diet of Galapagos hawk mainly include lizards, snakes and rodents. 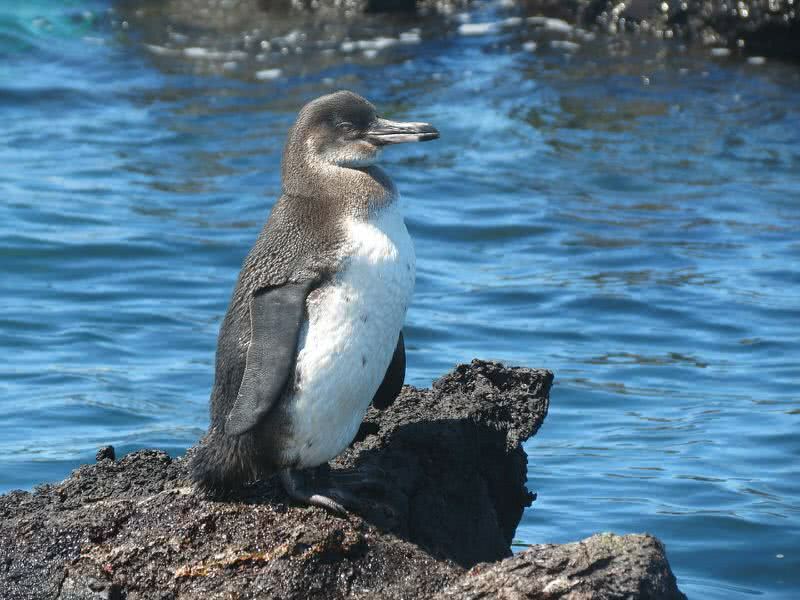 Galapagos penguins have smallest population size than any other species of penguins in the world. They are endemic to Islands of Galapagos. They survive in Galapagos due to the cool temperature bring by Humboldt and Cromwell ocean currents. They spent their day time in cool ocean currents and return to land at night. Galapagos penguins are identified by their large bill and narrow while line around the face. They grow up to a length of 19 inches and weighs around 2.5 kilograms. They made nests usually on Fernandina and Isabela Islands of Galapagos, 50 meters away from sea. It takes 30 or 40 days for the incubation of eggs. One penguin always stay with the eggs while other go away in searching for food. Galapagos fur seals are the smallest fur seals in the world. These little fur seals are widely distributed in the Islands of Galapagos. The total population in Galapagos estimated at 38000 – 40000. They lives in rocky shores of Galapagos. They are distinguished by their smaller size, thick fur and pointed nose. 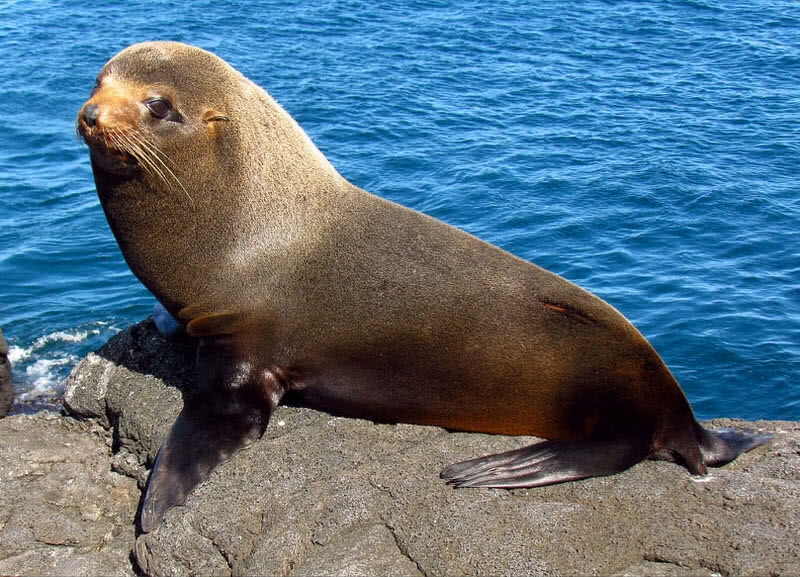 Galapagos fur seals spent most of their lifetime in sea. They have average length of 1.5 meters and weighs up to 65 kilograms. Their color varies from black to dark brown. Males fur seals becomes so aggressive during mating season to defend other males from their territories. Marine equanas are found only in the main Islands of Galapagos. They also known as Galapagos marine equanas. The ability to forage in sea also make this unique species of Galapagos as a marine reptile. The size of marine equanas varies between Islands. They have triangular shaped dorsals and long tail. The length of marine equanas varies between 20 and 40 inches and weighs up to 10 kilograms. They found in grey or black colors. The coloration of marine equanas also changes to green or red during mating season. Marine equanas can’t move effectively after they return to shore from the sea. It is because their body temperature falls down (up o 10 degree celcious) on diving into the sea. The regain normal body temperature by baking in the Sunlight. 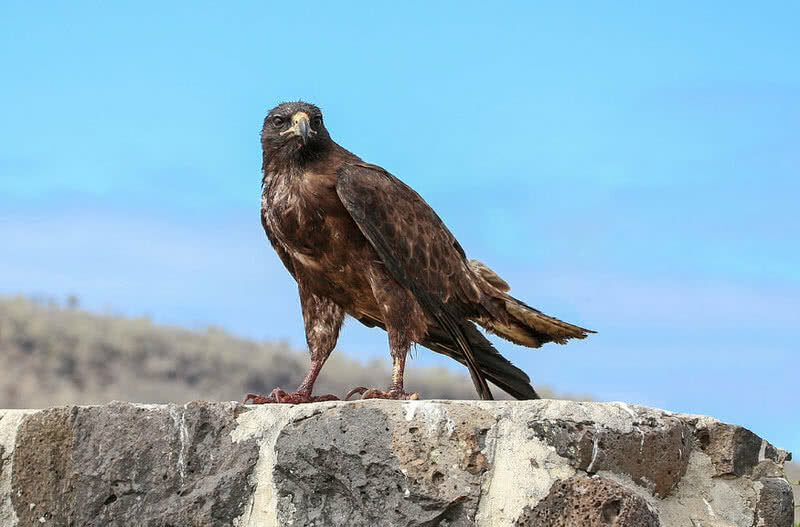 Galapagos hawks and sea birds are main predators of marine equanas. Galapagos tortoises are the largest living tortoises and one of longest living animals in the world. The archipelago itself named after this unique species of tortoise, ‘Galapago’ means tortoise in Spanish language. They are native to main Islands of Galapagos. They have average life span of 100 years or more. 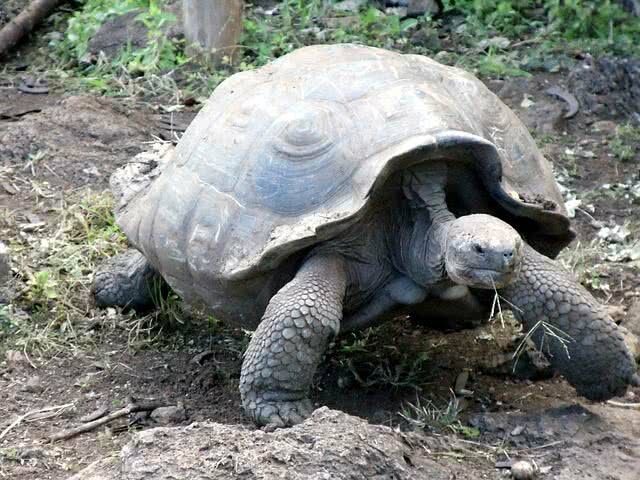 Galapagos tortoises are now listed as an endangered species, only 15000 remains today. These heaviest tortoises have length up to 5 feet and weighs between 250 to 320 kilograms. They are the largest land animal in Galapagos Islands. Galapagos tortoises have no natural predators. Interestingly they can live up to one years without food or water. It is because of slow metabolism and large internal store of water. They mainly feed on grass, leaves and cactus.